Rihanna has been making headlines non stop since the release of her eighth studio album ANTI, followed by the debut of her Fenty x PUMA line during NYFW and she’s keeping the momentum going with new promo pics. 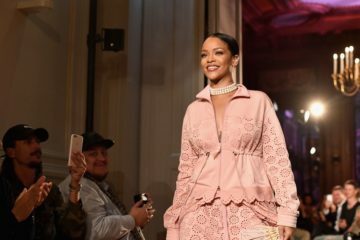 Along with a plethora of clothing items and accessories that are sure to be in high demand as soon as they become available for purchase, Rihanna’s Fenty x PUMA collection also includes footwear (of course!) This week, Rihanna has shifted the focus of the line to the footwear by sharing sneak peeks of the upcoming signature shoe “The Trainer” on social media. 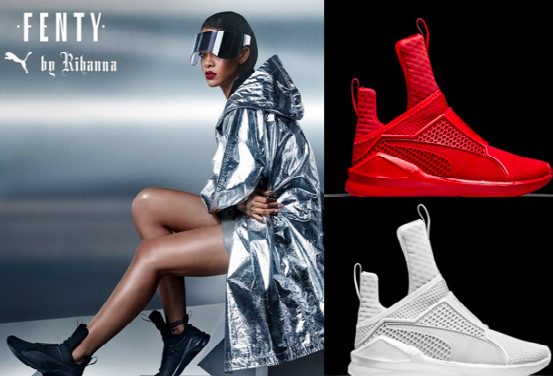 Outfitted in an over-sized metallic silver coat, matching visor and a pair of The Trainers in black, Rihanna is giving futuristic glam in the newest Fenty x PUMA promo pics. The shoes themselves intertwine the classic PUMA design with that of an updated moonboot that definitely has Rihanna’s style influence written all over it! The Fenty Trainers are also a nod to the gender neutral fashion trend that’s picking up steam this season, with solid color schemes and a sporty design that may find just as much appeal with male consumers as female this fall.